Shows how our everyday work can be a tremendous catalyst for spiritual growth Instead of regarding work as a diversion from the spiritual life, R. Paul Stevens and Alvin Ung are convinced that the workplace is a positive arena for personal spiritual growth - and here they show how that can be so in very practical ways. 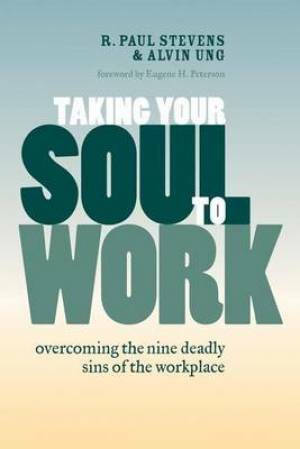 Taking Your Soul to Work examines both the nine deadly sins of the workplace("soul-sapping struggles at work") and the ninefold fruit of the Spirit. Through this approach the authors develop a holistic framework that shows how the Holy Spirit has given Christians powerful gifts to overcome the serious struggles that challenge them in their daily work. Tapping into the wisdom of great spiritual writers over the past two millennia, Stevens and Ung together draw out real-life dilemmas and offer practical tips for becoming vibrant disciples in the workplace. With brief, engaging chapters - each rounded out with an action plan or a case study plus suggested exercises - this helpful book is very well suited to small-group study. Taking Your Soul to Work by Alvin Ung; R. Paul Stevens was published by Eerdmans Publishing Company in November 2010 and is our 37361st best seller. The ISBN for Taking Your Soul to Work is 9780802865595. Be the first to review Taking Your Soul to Work! Got a question? No problem! Just click here to ask us about Taking Your Soul to Work.